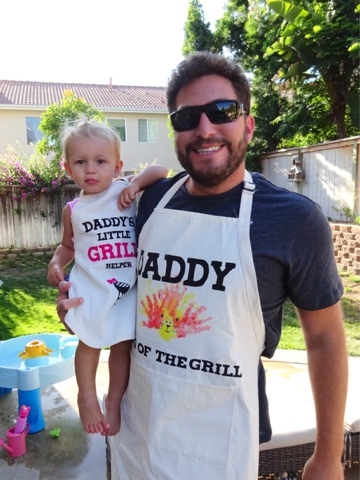 I am so excited to finally share with you the Father's Day gift we made for my hubby this year! I knew he might see it if I wrote about it prior to that day, so keep this gift idea in mind for next year! It was a huge hit! 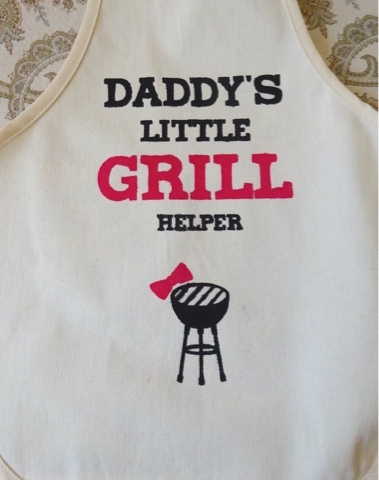 Hubs got a new grill as an early Father's Day/ it's summer and our old grill is falling apart present, so I knew I wanted to get him grilling accessories to go along with it. I put together a grill basket with some new grilling tools in it. I also love to give handmade gifts, so Henley and I made him an apron and I made one for her too. They turned out so adorable and they both loved them! 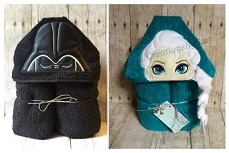 They are so easy to make; only took me maybe an hour total. NOTE: If you do not own a Silhouette, you can still make your own version of this! You could get stencil letters at the craft store or draw freehand and paint over it! 1. 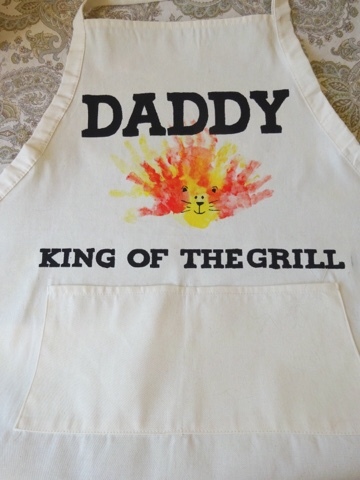 Using fabric paint and the sponge brush, paint your child's hand and make a fan shape of handprints on the Daddy apron. Let dry, then using the small paintbrush, paint a lion's face over the bottom portion of the prints. (The fingers make up the mane and the palms make up the face). Let dry completely. 2. Create your stencil on your Silhouette software and cut it out using vinyl. I buy basic vinyl on Amazon instead of Silhouete brand stencil vinyl because it's cheaper and you get more. I also use coupons at craft stores to buy transfer tape at 40-60% off depending on the coupon. Saves so much money that way! 3. Weed out your image and use the stencil tape to place your vinyl stencil where you want it on your aprons. 4. With a sponge brush and fabric paint, paint over your stencil carefully. I go over the image at least twice to make sure I have a bold and even coating of paint. Allow to dry completely before removing the vinyl (I let mine dry overnight, but a few hours is usually fine). 5. Iron over your image if your fabric paint calls for it. Silhouette brand fabric paint does, and in my opinion it's the best. It doesn't dry stiff like I have found some brands to do. Now, you're done! These aprons were a hit! 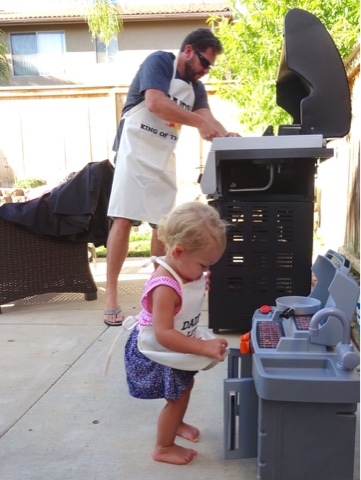 My hubby couldn't wait to try them out, and our little one was so excited to grill with her Daddy. Father's Day was great at our house! We started off with a nice breakfast, had a picnic lunch at the pool, then finished with a BBQ (of course)! How did you celebrate?